As a frequent traveler to Japan, I can’t count the number of collectors of Japanese firearms and militaria who have told me they would love to go to Japan, but for one reason or another, have never been. In 2017 I posted a notice in Banzai that I was prepared to lead an expedition focused on visiting places of interest to collectors. On November 11, 2018, I was at Narita Airport to greet three Banzai members, plus two of their spouses, as they landed for their big Japanese adventure. The intrepid multinational band, Don and Cathy Schlickman from Iowa, Zach and Jennifer Hammond from Texas, and Jim Sheehan from the UK had put their fates in my hands for two weeks. 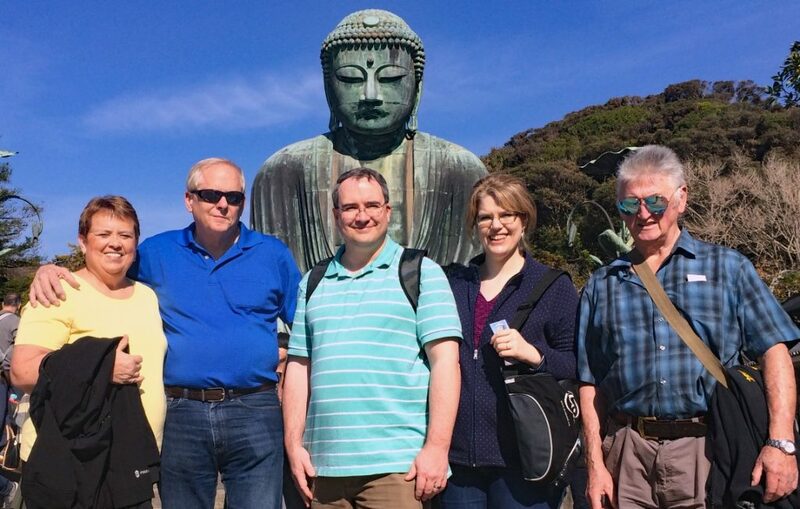 Left to right: Mr. Shigeo Sugawa, Jim Sheehan, Zach and Jennifer Hammond, Cathy and Don Schlickman. Taken at Mr. Sugawa’s office in Tokyo. One of the greatest things about Japan is the renowned hospitality of the Japanese people. The new arrivals had barely unpacked when one of Don’s contacts, Mr. Suzuki, came to join us in the hotel café. 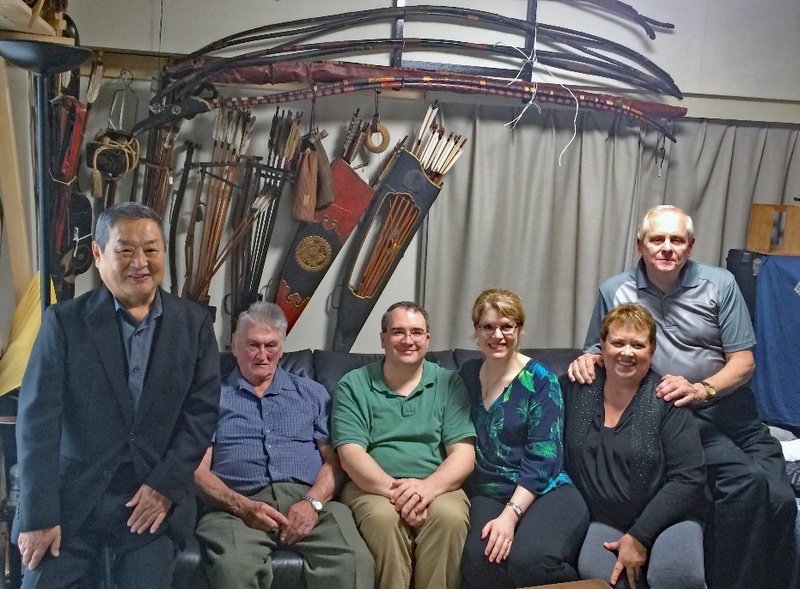 On Day 2, November 12, noted Japanese author Mr. Shigeo Sugawa graciously hosted us to lunch at the Tokyo American Club and then took us to his office and home for a personal viewing of his collections of samurai-era weaponry, such as bows and arrows, spears, halberds and matchlocks. On Day 3, Mr. Sugawa also kindly delayed his long-planned boar-hunting trip to help us to visit the Technical Museum of the Japanese Ground Self-Defense Forces Ordnance School. This is Japan’s only large-scale display of modern Japanese and foreign small arms, and access is strictly controlled. Since the museum is on an active military base, we had to get security clearances that take about two months. We were guided throughout by a friendly JGSDF Captain Egashira thanks to Mr. Sugawa’s revered status (he is an advisor to the museum). Nearby on the base are a memorial hall to the tokkōtai (“kamikaze”), a lovely garden, and a museum commemorating the cadets who trained there when Tsuchiura was an Imperial Japanese Navy base. 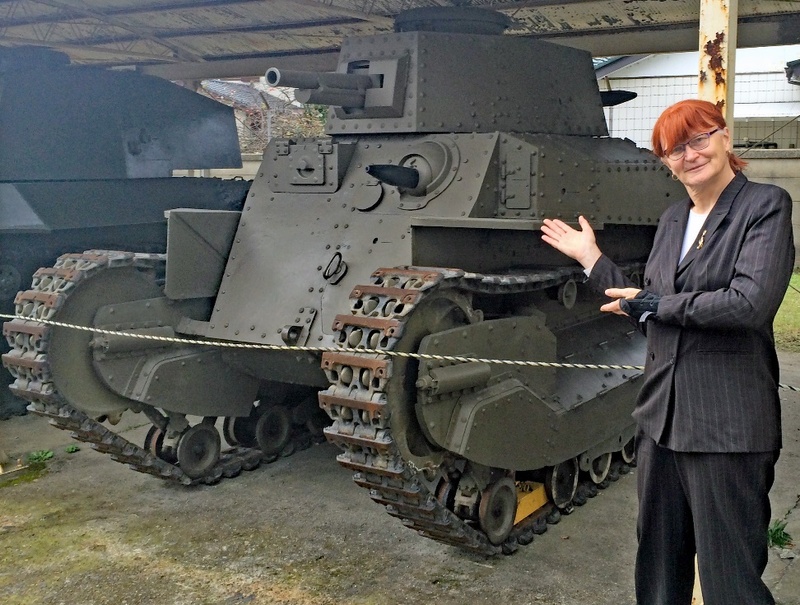 There are also displays of tanks and artillery (the lead photo at the head of this article shows me doing a Vanna White with a working Type 89 tank). On our return to Tokyo, we were greeted by another of Don’s contacts, Dan Makino, who joined us at a nearby steakhouse. Panorama shot of the Small Arms Museum at Tsuchiura JGSDF Base. Mr. Sugawa at far right. The following morning Banzai member Steve Wallace, who happened to be in Japan with his wife Bonnie, joined us as we visited Yasukuni Shrine and Yushukan, Tokyo’s best and most controversial military museum, Sensoji, Tokyo’s largest temple, and the bustling market at Ameyoko in Ueno. Jim takes a photo outside Yushukan in front of the memorials to military dogs, horses and pigeons. On Day 5, Mr. Kazuo Shiba, a Japanese gunsmith and collector well known to Banzai folk in California and Arizona from his frequent visits to the US to participate in Banzai events, kindly volunteered to use his personal vehicle to chauffeur the menfolk in the group around Tokyo. Cathy, Jennifer, Bonnie and I had a ladies’ day visiting the National Museum, the Ota Memorial Art Museum (devoted to woodblock prints), and Meiji Shrine. The guys spent the day marveling at the varied treasures on offer at Mr. Maekawa’s military antique shop and the deactivated firearms at Chicago Regimentals, then joined us for dinner. Modelling military haberdashery at Mr. Maekawa’s shop. Front and center is Mr. Maekawa. 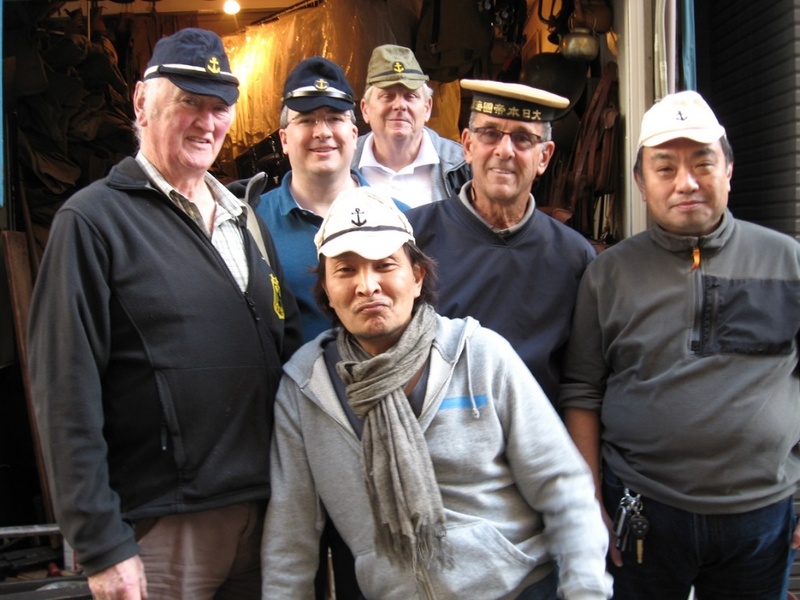 Left to right: Jim, Zach, Don, Steve and Mr. Kazuo Shiba. Photo taken by Hama-san, Mr. Maekawa’s English-speaking assistant. Seeking a brief respite from Tokyo’s hustle and bustle, on Day 6 we went out to Kamakura, briefly Japan’s capital some 800 years ago. If you have ever looked at period photo albums of Japanese servicemen who trained near Tokyo, you will probably have seen group shots of them here assembled in front of the Daibutsu (Great Buddha) shown below or at Tsugaoka Hachimangu Shrine. We also squeezed in the beach and Hase-dera Temple, with a magnificent view out over the Pacific. The highlight of Day 7 was a visit to the Dai Token Ichi Sword Show. We met Mr. Suzuki there again, and I even ran into a guy from my home base of Calgary, Alberta, Canada who recognized me from the displays I do at gun shows there. On Day 8 we headed to Kyoto by Shinkansen, the legendary “bullet train”. After checking into our hotel a stone’s throw from the station we headed to nearby Fushimi Inari Shrine before it got dark. Kyoto has 17 UNESCO-designated World Cultural heritage sites and we visited two more on Day 9, Nijo Castle and Sanjusangendo, with its 1,000 golden statues. Then Don, Cathy, Jim and I went up Kyoto Tower for a panorama of the city and surrounding hills. 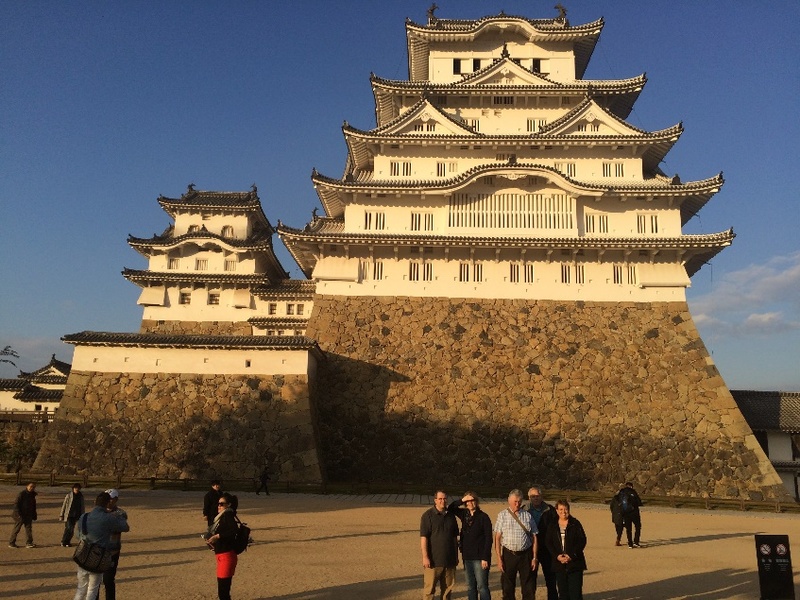 On Day 10 we took the bullet train to Hiroshima to see the Atomic Bomb Dome and Peace Museum, then backtracked to Himeji to see its famous castle, the largest surviving original castle in Japan. Himeji Castle with our group in the foreground. Day 11 included the Iwatayama Monkey Park (where I felt oddly at home), the Netsuke Museum, located in an original samurai home built in the 1820s, and a brief visit to Gion, one of the old traditional areas of Kyoto. The Kyoto National Museum had a major sword exhibit which we took in on Day 12. We were amazed at the staggering number of visitors, many of them women or repeat visitors who had travelled hours to go through the exhibit again. Clearly interest in traditional Japanese culture remains strong! By Day 13 it was time to head back to Tokyo. We rounded out our time there by visiting an antique mall and walking along neon-lit Ginza, Tokyo’s high-end shopping street. Day 14, November 24, the Schlickmans and Hammonds headed home, while Jim and I took in Akihabara, Tokyo’s center for electronics and pop culture, and Sunshine City, where a plaque marks the spot where Sugama Prison once stood. In the evening I was able to have dinner with a Canadian friend who happened to be in Japan, and on Sunday both Jim and I returned to our respective homes. What did we learn from this whirlwind? I think we proved that a Banzai expedition is feasible. Two weeks is barely enough to scratch the surface of Japan’s attractions, and there are many more places we could have gone, but I think a lot of good memories were created. I would say there were a few key success factors. First, six people was about as big a group as can travel together continuously because of seating capacity in typical restaurants, etc. I take a group of 24 students to Japan every May, but they are happy to run off as soon as my colleague and I will let them. Second, booking hotels within easy walking distance of a major train station greatly facilitated our logistics. Even so, I was amazed to hear from Cathy, who had a FitBit, that we were covering 14,000 to 24,000 steps a day. I thought I was taking it easy on the group! Third, we had a great group, in which everyone was willing to be flexible to ensure the others got to see the things of most interest to them. Finally, and perhaps most importantly, we benefitted from the invaluable assistance of many kind Japanese friends, such as Mr. Sugawa, Mr. Shiba, Mr. Maekawa and his assistant Hama-san, to name only a few. We are all extremely grateful to them. While this was a big undertaking, I think such trips are worthwhile as they can help to improve our understanding, revitalize our enthusiasm, and improve international collaboration by strengthening personal contacts. Bringing people together is always a good thing in these trying times. Copyright © 1996 - 2013 日本の武器兵器. All Rights Reserved.